Eligible providers need to select either a Medicare or a Medicaid CMS EHR Incentive Program for which to register. The Medicare reimbursement program is federally managed so that it is consistent across all states and requires a single registration through the CMS EHR website. 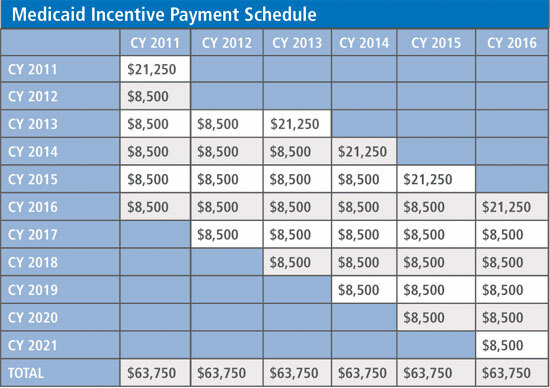 The deadline to register and begin attesting to Meaningful Use for Medicare to receive reimbursements was 2014, however providers are still able to register for and attest through the Medicare CMS EHR Incentive Program to avoid payment penalty adjustments. The Medicaid program is administered by the individual states so registration is slightly different in that providers will need to register through the CMS website, select the single state from which they seek reimbursement and then register with the selected state Medicaid organization. Medicaid is allowing providers to register for and begin Meaningful Use all the way until the last year of the program, which is 2021, however providers will not be able to collect the maximum potential incentives unless they begin the Medicaid program by the year 2016. Whether you are implementing an EMR for the first time or replacing your current software solution, the process of choosing and implementing an EMR can be very time-consuming. It is important to select your EMR as soon as possible to allow for the required time to successfully manage the implementation project, ensure training in Meaningful Use features and allow time for providers to monitor their success with meaningfully using your EMR. Get started thinking about how to plan for a successful EMR implementation. Download a FREE EMR Implementation White Paper. Eligible providers interested in securing incentive program reimbursement will need to prove (attest to) the use of an EMR certified by an ONC-ATCB. Providing the use of a certified system will require providers to simply access the ONC Certified Health IT Products Listwebsite and use the site search for their EMR. Providers will then use the website to generate a code, called the CHPL Code, which the provider will enter into their online CMS program registration application. Providers may register for an incentive program even if they are not currently using a certified EMR; simply leave the CHPL Code field in the application blank for now. Providers may access their CMS EHR Incentive Program registration at any time to update the field when they are working with a certified EMR and ready to begin the attestation phase to request reimbursement. If you are already a MicroMD EMR client, click here to access the “CMS EHR Certification ID”for your version of EMR. In order to receive incentive payments for attesting to Meaningful Use, providers were required to join the program and begin attesting no later than 2014. However, providers who did not begin attesting by 2013 were subject to penalty payment adjustments beginning in 2014, starting with a rate of 1%. Penalty adjustment rates are scheduled to increase each year with 2015 adjustments of 2% and 2016 adjustments of 3%. For providers who joined the Medicare program before the incentive cutoff, they are eligible to receive reimbursement of up to 75% of their maximum Medicare Part B allowable charges, annually, not to exceed the program maximum payout amounts by year. Please see the charts below to determine maximum Medicare annual reimbursements and the payout schedule. Providers practicing in a federally designated Health Professional Shortage Area are eligible for a 10% additional incentive bonus. 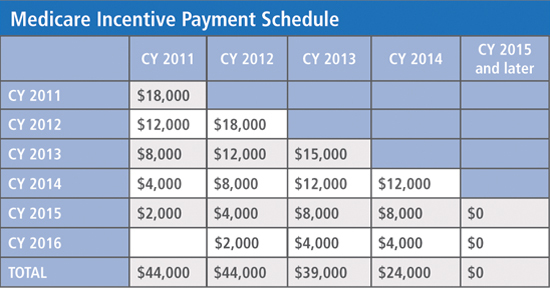 Please see the chart below to determine maximum Medicare annual reimbursements and the payout schedule. After attestation, when will Medicare incentive payments be issued? Per the CMS EHR Incentive Program website, incentive payments to EPs for the Medicare EHR Incentive Program will be made approximately four to eight weeks after an EP successfully attests that they have demonstrated meaningful use of certified EHR technology. However, EPs will not receive incentive payments within that timeframe if they have not yet met the threshold for allowed charges for covered professional services furnished by the EP during the year. Payments will be held until the EP meets the threshold in allowed charges for each calendar year in order to maximize the amount of the EHR incentive payment they receive. If the EP has not met the threshold in allowed charges by the end of the calendar year, CMS expects to issue an incentive payment for the EP in March of the following year (allowing 60 days after the end of the calendar year for all pending claims to be processed). Payments to Medicare EPs will be made to the taxpayer identification number (TIN) selected at the time of registration, through the same channels their claims payments are made. The form of payment (electronic funds transfer or check) will be the same as claims payments. Bonus payments for EPs who practice predominantly in a geographic Health Professional Shortage Area (HPSA) will be made as separate lump-sum payments no later than 120 days after the end of the calendar year for which the EP was eligible for the bonus payment. Please note that the reporting period the EP selects does not affect the amount of the EHR incentive payments. The Medicare EHR incentive payments to EPs are based on 75% of the estimated allowed charges for covered professional services furnished by the EP during the entire payment year. If the EP has not met the threshold in allowed charges at the time of the attestation, CMS will hold the incentive payment until the EP meets the threshold as described above. Providers may register for the Medicare program now through the CMS EHR Incentive Program Registration and Attestation page. Pay close attention to the information that will be required for registration. Gather all the required info and complete the registration. The website will verify eligibility and inform the provider whether the registration was successful. For the Medicaid program, providers having over 30% of total patient visits dedicated to Medicaid are eligible to receive reimbursement of up to 85% of their net allowable charges for EMR purchase, implementation, training, support etc. required for the provider to adopt, implement or use EMR. Pediatricians who may not have 30% of their patient visits dedicated to Medicaid may still participate if at least 20% of their visits are Medicaid, although Pediatricians that opt for this relaxed percentage will only be eligible to receive 66% of the maximum reimbursement each payment year. In the first desired payment year, Medicaid incentive program providers only need to prove adoption, implementation or use of a certified EMR in order to secure reimbursement. The second payment year will require 90 days of consecutive meaningful use. Third and subsequent payment years will require 365 days of meaningful use according to the current stage. Providers should verify the requirements with their state Medicaid organization. Finally, providers participating in multiple state Medicaid programs must select a single state from which to secure reimbursement. Please see the chart below to determine maximum Medicaid annual reimbursements and the payment schedule. As the Medicaid incentive programs are established by each state, providers will need to check with their state Medicaid organization to verify if and when their state program will be open for registration and well as requirements and reimbursement payment timelines. Click here to access the CMS list of Medicaid programs and their current status. Providers should verify if there will be any additional requirements to register for their state Medicaid program, as each state may have requirements that differ from the Medicare registration. Additionally, Medicaid programs will require a two part registration. First, providers will need to register with the CMS for an EHR Incentive Program through the CMS EHR Incentive Program Registration and Attestation page. Once registration is successfully completed through the CMS website, providers will be directed to follow up with their state Medicaid organization to complete the second part of their registration.